"Life's Been Good" is a song by Joe Walsh, which first appeared on the soundtrack to the film FM. The original eight-minute version was released on Walsh's album But Seriously, Folks..., and an edited 4 1/2 minute single version peaked at #12 on the US Billboard Hot 100, remaining his biggest solo hit. In the song, Walsh satirically reflects on the antics and excess of the era's rock stars, with nods to Keith Moon and others: "I live in hotels/Tear out the walls", and "My Maserati does one-eighty-five/I lost my license, now I don't drive". The automobile that Walsh himself owned at the time was a 1964 Maserati 5000 GT, and while fast, could manage only 170mph with tall gearing. The 1979 Rolling Stone Record Guide called it "riotous", and "(maybe) the most important statement on rock stardom anyone has made in the late Seventies". His later Ordinary Average Guy is written as a late-life followup. The song is used in the Kevin Smith film Jay and Silent Bob Strike Back during the opening of the movie, where the titular characters are left outside of a quickstop (from Smith's earlier film Clerks) by their respective parents. However, it did not appear on the soundtrack album. "Life's Been Good" has a mid-tempo, reggae-like groove marked by bedrock guitar riffs, synthesizers, and humorous lyrics. Walsh's ARP Odyssey synthesizer riff accompanies the lead guitar in the middle of the song. The lead guitar in the outro is accompanied by the main riff. Bill Szymczyk and Jody Boyer perform the backing vocals. The pre-chorus section on the second and third verses uses a call and response pattern. Joe Walsh: "Lucky I'm sane after all I've been through"
Call: Bill Szymczyk: "Everybody say I'm cool"
Response: Jody Boyer: "He's cool"
Joe Walsh: "They say I'm lazy but it takes all my time"
Call: Bill Szymczyk: "Everybody say, "Oh, yeah""
Response: Jody Boyer: "Oh, yeah!" At the end of the LP, there is a clip of an inside joke stating "uh-oh, here comes a flock of wah wahs", recorded from inside the studio. After the music has faded away into silence, there's a 10-second gap before the inside joke. That inside joke would also be included at the end of disc one of the Eagles' box set, Selected Works: 1972–1999. Made after Walsh had joined the Eagles, "Life's Been Good" was incorporated into that group's concert repertoire, appearing in shows at the time as well as reunion tours. It remains a staple of classic rock radio playlists. A live version of the song with the Eagles appears on the 1980 album Eagles Live, where some of the lyrics are changed. In 2013, this song was sampled on Eminem's "So Far..." off The Marshall Mathers LP 2, produced by Rick Rubin. ^ a b "Joe Walsh > Charts & Awards > Billboard Singles". Allmusic. Retrieved January 29, 2010. ^ "RPM Volume 29 No. 22, August 26, 1978". RPM. Retrieved January 29, 2010. ^ "irishcharts.ie search results". Retrieved February 2, 2010. ^ "charts.org.nz - Joe Walsh - Life's Been Good". Retrieved January 29, 2010. 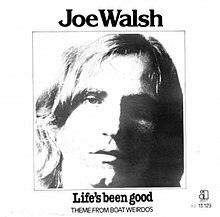 ^ "Chart Stats - Joe Walsh - Life's Been Good". Retrieved January 29, 2010. ^ "Top Singles – Volume 30, No. 14, December 30 1978". RPM. Library and Archives Canada. Retrieved July 21, 2014. ^ "Top 100 Hits of 1978/Top 100 Songs of 1978". Musicoutfitters.com. Retrieved April 4, 2017.